UDM Downloads > Advanced Email Verifier! Advanced Email Verifier is your powerful solution for the "message delivery error". AEV is designed for system administrators, webmasters, programmers as well as for those Internet marketers who have their own mailing lists and need to keep them up-to-date. If you have email addresses stored in a database on your computer or on a remote server, you can connect to that database directly from Advanced E-mail Verifier and verify the email addresses. Advanced E-mail Verifier works with any ODBC compliant database. During the verification Advanced E-mail Verifier will write the results directly to the database so you don't need to export anything. With Advanced E-mail Verifier you can: -verify email addresses directly from ODBC compatible databases without import-export -import email lists for verification from Paradox, DBase, Excel, Text (.CSV, Word HTML, Lotus 1-2-3, QuattroPro, XML, MS Access files, ADO Connection, DBISAM and Clarion tables (.dat files) -load large email lists for verification in a quick and easy way -export the verification results to Paradox, DBase, Excel, Text (.CSV), HTML, Word, SYLK, DIF, Lotus 1-2-3, QuattroPro, SQL script, XML, MS Access, Rich text format files, and MS Windows Clipboard -decrease the Internet traffic by excluding undeliverable email addresses from your email list Advanced E-mail Verifier provides you with a flexible system of rules to process the email addresses. With Advanced E-mail Verifier you can sort and filter the email addresses as you want and arrange the records in most handy way for you. 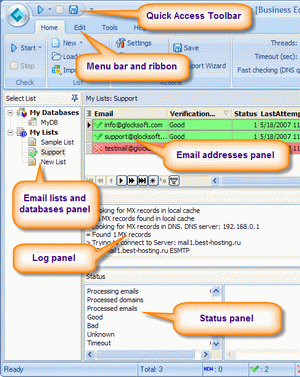 Advanced E-mail Verifier, with its easy-to-use wizards, is the most powerful email verifier software available today! You don't need to disturb their clients and friends anymore to check if their email addresses are still valid. Advanced E-mail Verifier will do it for you keeping you from sending undeliverable messages that cause a ping-pong of useless messages between SMTP servers.